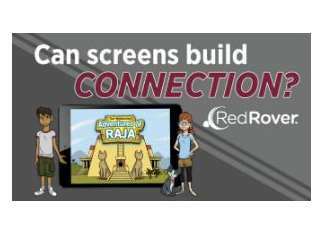 We're celebrating the release of the third and final installment of RedRover's Empathy app series, The Restricted Adventures of Raja. Join us on at this special family-friendly event to learn how a mobile app for kids can actually help foster a culture of connection and empathy at home, in the classroom, and in our community. This event will feature: A RedRover Readers Corner for kids of all ages from 4-6pm, hosted by our RedRover Readers program, complete with a sample reading and discussion experience, a craft to benefit homeless animals, refreshments, and a special appearance from Raja! An opportunity for kids to participate in a live demonstration of how educators could use the app in a classroom. Adults can enjoy appetizers and beverages while learning more about the intersection of digital technology and empathy and engaging in a Q&A session. Guest speakers include children's media expert Kristen McGregor, app developer Ted Brunt, and emcee Donna Apidone from Capital Public Radio. RSVP today at redrover.org/applaunch! Learn more about The Restricted Adventures of Raja Empathy app series at redrover.org/raja.